King James I was assassinated on February 20, 1437 at Blackfriars' Monastery in Perth by Sir Robert Graham and his accomplices. They had been put up to the job by the King's Chamberlain, Sir Robert Stewart, who felt that James' claim to the throne was invalid and that the rightful king was no other than his own grandfather, Walter Stewart, the 72 year of Earl of Atholl, who was a son of King Robert II. Graham had long borne a grudge against the King because his nephew had been deprived of the Earldom of Strathearn. He hoped to get the earldom restored to his family when the Earl of Atholl took the throne. The regicides fled into Atholl, but were pursued and captured by Robert "Riabhach" or "Grizzled Robert", 4th chief of our clan along with help from Stewart of Garth in a lonely glen in Atholl. The Earl of Atholl had been rewarded by the King with his second earldom, the Earldom of Strathearn in 1427 for loyal service to the Crown and this was how the traitor repaid his King. Our Chief handed them both over to the authorities and they were hanged, drawn and quartered at Sterling Castle and the Earl's estates and titles reverted to the Crown. The new King, James II, was a boy of six when this happened. For the next twelve years, rival factions strove to rule Scotland in his name and their own interests. The young King had changed into a ruler with a ruthless determination to right many wrongs and he did. When he came of age, it is said that he offered the earldom to our Chief in acknowledgment of his services to the crown in capturing his father's murderers, but that our Chief refused the Earldom and requested instead that his lands be erected into a free Barony "for the capture of that most vile traitor the late Robert the Graham." 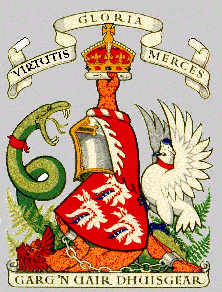 This was granted to him on August 15, 1451, along with the clan motto "Virtutis Gloria Merces" or "Glory is the Reward of Valour". This exploit is also commemorated by the Chief's crest of a right hand supporting an imperial crown and also by an augmentation to his arms of a chained naked man (Robert Graham) who forms an unusual "compartment" below our Chief's shield of three wolf heads. There is a traditional story that says that at the time of this royal charter, our chief was dying of a mortal wound to his head received in a fight with Robert Forrester of Torwood, nephew to the Bishop of Dunkeld. On his way to Perth, our chief fought with Forrester at Ardonachy, located about a half mile southeast of Auchtergaven church. Having bound up his head, he road in this bloody state to Perth and there received from the hands of his grateful king, the new grant of his lands of Strowan. This conflict was in response to a raid on the lands of Little Dunkeld by our clan which our Chief considered to be his and which the Bishop of Dunked had granted to Forrester. Upon returning home with the Royal Charter, he died soon after from the wound. This is a nice story, but the facts do not totally support the story. The events did happen, but the fight occurred in 1460, nine years after the Charter was granted. The clan soon avenged Robert's death when the call came for the clans to support King James II for service at the siege of Roxburgh in 1460. On our way to support the siege, the clan just happened to be in Forrester's vicinity and we plundered his lands of Torwood. At the Siege, the King often amused himself by working the great siege guns with his own hands. On August 3, 1460, the King was accidentally killed when one of the Scottish cannons burst. Two days later, Roxburgh surrendered. The new King, James III, was but a boy of nine. Robert's son, Alexander Duncanson, became our 5th chief in 1460 and it was he who definitely assumed the surname of Robertson and supported its common usage among the clanfolk. He also added "of Strowan" to connect himself to his father's estate by which name he wanted the barony to be known. In 1457, six years after rewarding Robert with the Strowan barony, King James bestowed the vacant Earldom of Atholl, dormant for 20 years on his maternal half-brother, Sir John Stewart of Lorn, ancestor to the present Duke of Atholl. It is interesting to note that Alexander's first wife was Elizabeth Lyon, great-great granddaughter of King Robert II. After her death, Alexander married a second time to Lady Elizabeth Stewart, who was the daughter of the new Earl. This is another of the many family connections that helped unite the Atholl clans.